✭ A show of early work of R.C. Gorman (1931-2005) opens January 15 at the National Museum of the American Indian. The exhibition, "R.C. Gorman: Early Prints and Drawing, 1966 - 1974", will feature 28 drawings and lithographs, including several nudes, a rare self-portrait, a series based on Navajo weaving designs, and a print, Yei-bi-Chai, created for Gorman's solo show in 1975 at the Museum of the American Indian, Heye Foundation (New York City), and reproduced as a poster. Image above at left: R.C. 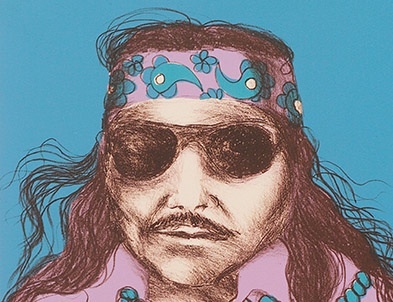 Gorman, Self-Portrait, Lithograph Print on Paper, 16/60; 33.2cm x 24.3 cm, 1973; Printed at Tamarind Institute. Work in the show, which will be on view until May 1, 2011, is drawn from the Indian Arts and Crafts Board Collection, U.S. Department of the Interior, NMAI. Images in addition to Self-Portrait that are part of the collection and viewable online: Bodies, Navajo Mother in Supplication, Sleep, Navajo Woman Drying Her Hair, and Homage to Spider Woman. NMAI's exhibition "Vantage Point: The Contemporary Native Art Collection", with paintings, drawings, photography, video projections, and mixed media installations from 25 artists, is on view through August 7, 2011. ✭ Figge Art Museum, Davenport, Iowa, presents "Tracks: The Railroad in Photographs from the George Eastman House Collection", January 15 - April 24, 2011. The show, organized by George Eastman House, explores 160 years of railroad and photographic history and includes the work of such eminent photographers as Alvin Langdon and Aaron Siskind. A series of lectures related to the show is planned. ✭ Opening at the Birmingham (Alabama) Museum of Art on January 30 is "Darkroom: Photography and New Media in South Africa Since 1950". Featuring the work of 18 photographers and new media and video artists who lived and worked in South Africa during apartheid (1948-1994), including William Kentridge, Robin Rhode (also see here), Jurgen Schadeberg, Nontsikelelo Veleko, and Sue Williamson, the exhibition comprises eight sections of vintage prints, recent images, photo-based installations, and video art. 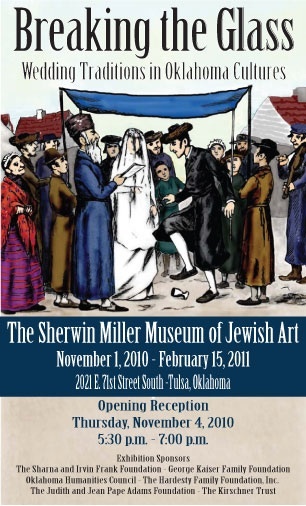 ✭ In Tulsa, "Breaking the Glass: Wedding Traditions in Oklahoma Cultures" continues at The Sherwin Miller Museum of Jewish Art through February 15. ✭ Illustrated botanical books from the collections of the Amon Carter Museum, Fort Worth, Texas, and the Botanical Research Institute of Texas will be on view at the Amon Carter beginning January 29. The exhibition, "Nature Bound: Illustrated Botanical Books", is arranged chronologically, from early the 17th Century though the 19th Century. The books on view not only document the evolution of illustration and printing techniques, they also offer a chance to examine the interrelationship of art and science via collaborations by botanists, horticulturists, naturalists, draftsmen, painters, printmakers, publishers, and printers. To view three examples from botanical books included in the exhibition, go here, here, and here. An ArtFinding report on 2010 art market trends estimates buying intentions, worldwide. My thanks to Rob Jones at artPark who alerted readers to the survey. but sometimes they make all kinds of important noise. Yileen Press has published a new anthology, Poets for Haiti, that includes the work of 23 exceptional writers, including Jericho Brown, Lucille Clifton, Kim Stafford, Robert Pinsky, Rosanna Warren, and Gail Mazur, and seven artists, including Edouard Duval-Carrie and Pascale Monnin. The book, dedicated to the people of Haiti and those who work on their behalf, is the result of a gathering of poets for a benefit reading at Harvard University six weeks after the January 12, 2010, earthquake that devastated the island nation. All proceeds from sales of the anthology, which includes stunning artwork by Haiti's wonderful visual artists, will benefit Partners in Health, which delivers community-based health care services to some of the poorest and most remote areas in Haiti. The creation of PIH by Dr. Paul Farmer is the subject of Tracey Kidder's Mountains Beyond Mountains. Farmer and Ophelia Dahl, executive director of PIH, contributed the Preface. The collection is edited by poet and novelist Kim Triedman, who worked with Jim Henle to organize the Harvard reading. I hope you will order copy of the collection and support the wonderful work being done by PIH. (To order (including via PayPal), go here.) I received my copy on the day before Christmas and can attest that this is a splendid collection that speaks eloquently to the hope we all have for Haiti. I no longer remember where I first encountered British poet, essayist, and memoirist John Siddique but for some time now I have been following and enjoying Siddique's posts at A Writer's Life. Recently, I decided to search out more of Siddique's work and discovered online a number of his commissions, two of which I highlight below (others include pieces for BBC Radio, the Arts Council of England, and Lancaster University). A British Council Writer-in-Residence at California State University/Los Angeles in 2009, Siddique is the author of Full Blood (Salt Publishing), forthcoming in April; Recital — An Almanac (Salt Modern Poets/Salt Publishing, 2009), Poems from a Northern Soul (Crocus, 2007), The Prize (Rialto, 2005), and a memoir, Four Fathers (Route Publishing, 2006). He also is the author of a children's book, Don't Wear It On Your Head, Don't Stick It Down Your Pants (Salt Publishing, 2010). In addition, Siddique has published work in many, many anthologies, a number of which are listed on his Website. The film Allegories of Power is a commission of the Bradford Council, in West Yorkshire, United Kingdom, and Cartwright Hall, Bradford's civic art gallery. Produced by freelance filmmaker Charlotte Taylor, who filmed the old textile machinery in Bradford Industrial Museum, Allegories of Power uses Siddique's two-part poem to beautiful effect. The voice is Siddique's. The film is available on Vimeo to registered users. In the video below, Siddique reads his poem "Lustre", which is inspired by pottery in an exhibition, "Exporting Beauty: Pilkington's Pottery and Tiles", on view at Manchester Art Gallery, Manchester, United Kingdom, until October 9, 2011. Siddique was commissioned jointly by the gallery and Manchester Literature Festival to respond to the exhibition, which features more than 100 pots and tiles made by the world-famous pottery company between 1893 and 1938. "Lustre" draws on the exhibit, the craft workers who fashioned the objects, the materials used, and nature, including Belle Vue Zoo, which one artist visited to make observational studies. The film, made by Maria Gabriella Ruban, is one of a number of unique commissions celebrating MLF's fifth anniversary. Lustre from Manchester Art Gallery on Vimeo. A downloadable pdf of "Lustre" is here. Moving Manchester Commission, for which Siddique wrote a sequence of poems, "From a Seed to a Flower: Five Poems From Real Lives", based on interviews with migrants in and around Piccadilly. 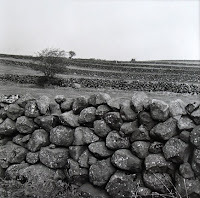 Accompanying the poems are Siddique's photographs. Early History of Pilkington's Tile and Pottery Company Ltd. I wrote this poem in response to a challenge posted at the networking site She Writes by my friend Jenne' R. Andrews (see her blog La Parola Vivace) following her reading of Dorianne Laux's "Antilamentation". I offer this poem for One Stop Poetry's weekly One Shot Wednesday event. Be sure to visit the site late Tuesday afternoon and evening and every Wednesday for links to the many contributors' "one shot" poems. the television picture going to snow. I wrote this poem for Carry on Tuesday, which each week provides a prompt that participants are to use wholly or partly in an original poem or prose piece. The prompt for Tuesday, December 28, consists of the opening line of Helen Hunt Jackson's poem "New Year's Morning": Only a night from old to new! Anyone may respond to the prompt. Go here for instructions for Prompt #85 and to add the link to your contribution. These Mississippi beauties I extol. Huckleberry bushes with pink rosettes. Water lilies. An open cotton boll. Cows in lush pastures and puppies as pets. Magnolia blooms and stars in velvet night. . . .
~ Winifred Hamrick Farrar, Excerpt from "Treasures"
Winifred Hamrick Farrar, appointed Mississippi's Poet Laureate on July 31, 1978, died on November 6, 2010. Farrar was only the third person to hold the lifetime, unpaid position, which at this time is vacant. The first Poet Laureate was Maude Williard Leet Prenshaw, who served from 1963 to 1971. She was succeeded by Louise Moss Montgomery. The appointee is selected from a candidate list prepared for the governor by the Mississippi Poetry Society. As noted by Farrar, the incumbent is to be available to "judge contests, speak at workshops, give readings and write the occasional poem on request"*; otherwise, the job is undefined. While Poet Laureate, Farrar attended many literary festivals, conventions, and conferences; served as a poetry contest judge; and frequently participated in poetry readings. Her published work included Cry Life (1968), The Seeking Spirit (1974), and Behind the Ridge (South and West, 1987), all out of print. In September 2007, at the request of ABC News, Farrar appeared on Good Morning America, reading a commissioned poem, "Treasures", about Mississippi and commemorating the one-year anniversary of Mississippi native Robin Roberts. Other details about Farrar's life and work are found in the obituary notices listed below; I've also listed the various volumes, such as Who's Who in Poetry, in which Farrar received recognition. Down the path while we swore the corn had lungs? Dreading something awesome beyond our will? When a new Poet Laureate is announced, I'll prepare a profile. talk in silence of promise bright renewed. I wrote this poem for today's One Shoot Sunday Poetry Challenge at One Stop Poetry. 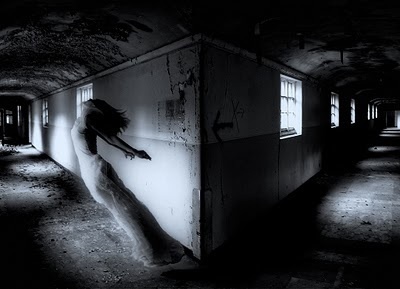 Anyone may participate by writing a poem or piece of "flash fiction" in response to the picture. Go here for information about accepting the challenge and to read others' contributions. Below you will find a lovely multimedia presentation: the setting of Geertgen tot Sint Jans' The Nativity by Night, set to "Holy, Holy, Holy" by Sufjan Stevens. Merry Christmas, everyone! May you each be graced with the blessings and promise of this holiday season. My thanks to ArtWay, where I first learned of the availability of this video. It is believed that the oil on oak painting may have been done around 1490. The painting hangs in The National Gallery, London. 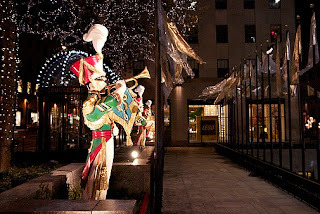 For Marleen Hengelaar-Rookmaaker's visual "meditation" on Nativity by Night, go here. A new Art History Channel®, a Cable TV Network, has launched with the aim of offering high-quality programming about painting, sculpture, architecture, ceramics, furniture, and decorative objects. Coming in Spring 2011 is an original weekly series, "Art of the Centuries", with programs on, for example, Cezanne, Georgia O'Keefe, Mondrian, Mary Cassatt, Robert Motherwell, and Mark Rothko. Other promising features on AHC's site include a 21st Century Gallery (this is in development), Art Book of the Month, Art Talk, and a section for gallery member services and benefits, such as exhibition promotions, artist index, and ad sales. AHC is seeking new artists for an online art gallery and program to be titled "21st Century Artists". Any visual artist working in any medium or subject may apply for membership and, if accepted, the member's artwork will be presented on the gallery Website and the Cable TV Network show. If interested, send five jpeg images and your name, e-mail address, telephone number, artists statement, and biography or a link to your online portfolio to submission@arthistorychannel.com. Celebrating its fourth anniversary, Civilian Art Projects, in Washington, D.C., has announced a new initiative, Civilian Editions, through which the gallery will offer high-quality, low-cost prints of original works by represented and invited guest artists. Launched December 10 with an exhibition in its project space, Civilian Editions makes prints available in three standard sizes (8"x10", 11"x14", 16"x20") in signed and numbered editions of 100. The prints will be custom-printed on Hahnemuhle Fine Art Paper by Bridget Lambert of Furthermore Print, also in D.C.
Prices will range from $100 for an 8x10-inch print to $300 for a 16x20-inch print. 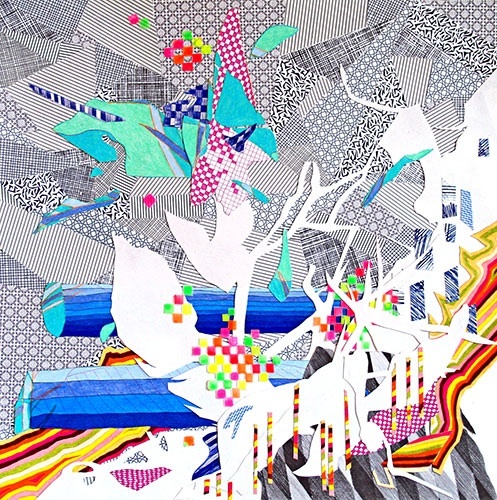 Artists whose work is reproduced for Civilian Editions include Ken Ashton, Ryan Hill, Cara Ober, Nickki Painter (see image above; Painter's site), and Trish Tillman. The complete artist list and images available are here. CAP will add work continually, so check back periodically to see what's available. ✭ In San Francisco, "Beyond Golden Clouds: Five Centuries of Japanese Screens" continues at the Asian Art Museum through January 16, 2011. The exhibit showcases 41 large-scale examples of folding screens, called byobu ("wind wall") from the collections of the Art Institute of Chicago and St. Louis Art Museum. Media include paper and silk, stoneware, and varnish. The screens date from the late 16th Century to the late 20th Century. On YouTube you'll find "The Making of Okura Jiro's Mountain Lake Tachi Screen Series", screens from which are included in the exhibition. ✭ Photographs of Kael Alford, who embedded with the U.S. military while covering the Iraq War, are on view through January 16 at The Art Museum at the University of Kentucky. The exhibit is part of the museum's Robert C. May Photography Lecture Series. Alford, who in 2008 was awarded a fellowship from the Nieman Foundation for Journalism at Harvard, collaborated with three other independent photojournalists to produce a book and traveling exhibition of photographs from Iraq: Unembedded: Four Independent Photojournalists on the War in Iraq. A number of videos about Alford's work are on YouTube and Vimeo. See, for example, Home on the Water: Louisiana's Disappearing Coast. ✭ The Cleveland Museum of Art is commemorating the 50th anniversary of the Cleveland Arts Prize with "In Honor of the Cleveland Arts Prize", on view through March 13. The show features approximately 30 works in all media by former prize winners. Artists in the show include Julian Stanczak, Hildur Asgeirsdottir Jonsson, Claude Conover, Moe Brooker, and Kenneth Bates. ✭ In Tacoma, Washington, Museum of Glass is featuring through September 6, 2011, work by American artist Beth Lipman and Scandinavian artist Ingalena Klenell. The show, "Glimmering Gone", includes Lipman's clear glass assemblages of fruits, flowers, and topiary forms and Klenell's kiln-formed clear glass pieces overlaid with lacework patterns, as well as a sequence of three installations created during the artists' residency in January 2010 in the Museum's Hot Shop: Memento, Landscape, and Artifacts. The combination of kiln-formed, blown, and sculpted (cut, polished, fractured) glass is extraordinary. This video shows the artists discussing their work for the collaborative exhibition. A hard-cover catalogue, Glimmering Gone: Ingalena Klenell and Beth Lipman, published in association with the University of Washington Press, is available. A slideshow of some images from the show is here. ✭ Pae White, a Los Angeles-based artist, has created a digital animation, Dying Oak (2009), around, through, and inside an 800-year-old oak tree. White used 3-D scanning technology to gather visual data from the tree's interior and exterior and then transformed the data into clusters of glowing dots that shift between representation and abstraction. The film is on view at St. Louis Art Museum through January 16. In this video, Pae White discusses her work at the Venice Biennale 2009. I offer this poem for today's "Special Christmas Eve Eve Poetry" event at One Stop Poetry. Just think how impressed your holiday guests will be when you share your knowledge about Tom Waits, Wilhelm Conrad Roentgen, Orchard House, Wanda Coleman, flying snakes, and an infamous error in a Bible printed in England. Oh, go ahead; show off a little! ✦ The experience of homelessness is the subject of a collaborative poetry and photography project by singer-songwriter Tom Waits and photographer Michael O'Brien. The pair's book, Hard Ground, which will be published in March 2011 by the University of Texas Press, is Waits' first poetry collection. ✦ The 115th anniversary of Wilhelm Conrad Roentgen's discovery of electromagnetic radiation — x-ray — was celebrated on November 8, 2010. Roentgen won the Nobel Prize in Physics in 1901. ✦ Pigs may not fly any time soon but certain kinds of snakes do: the Chrysopelea — or, as it is more commonly known, flying snake. Found in Burma, southern Thailand, parts of Malaysia, Singapore, Indonesia, and parts of the Philippines, the Chrysopelea sinuously parachutes from tree to tree. The subject of ongoing research (including Defense Department-funded studies), the snake even has it own Website, where you will find FAQs, aerial images, and video. ✦ A 1631 printing of the Bible in England contains an infamous misprint of the Seventh Commandment. It seems, according to this interesting recent article, that a most important three-letter word — not —was not included. The Bishop of London dutifully reported the not-so-little and grievous error of the royal printers Barker and Lucas to King Charles I, who in turn stripped the men of their license and set a fine upon the heads. To the scandalized Archbishop of Canterbury's eternal regret, that version ever thereafter has been known as "The Wicked Bible". ✦ Louisa May Alcott's "Orchard House", the setting for Little Women and the place where Alcott wrote her much-loved classic, has a Website of its own. It's even possible to tour its rooms without leaving your desktop. 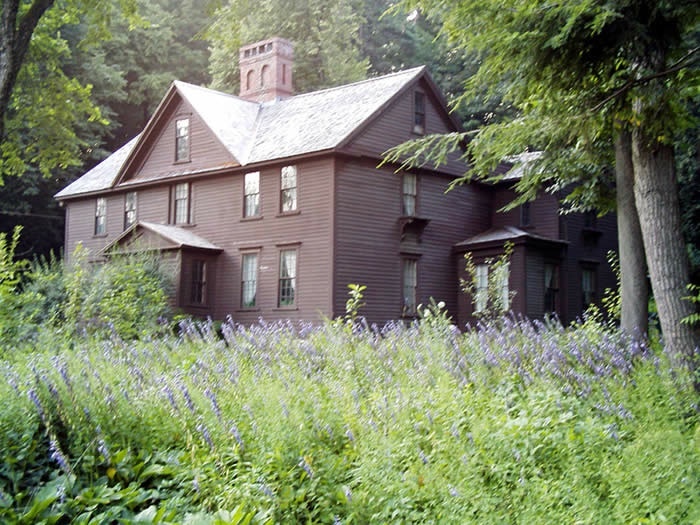 A good thing that is, because the house is shown by guided tour only and you would not want to arrive unexpected. Fire laws of Historic Concord, Massachusetts, where the house is located, restrict the number of visitors at any one time and parking can be a dreadful problem. Still, the "very basic" guide to the National Historic Landmark is available not only in English but Chinese, French, German, Italian, Japanese, Russian, Spanish, and Esperanto; moreover, several staff are trained in American Sign Language. Alcott, by the way, would have turned 178 on November 29. ✦ Who says poets aren't well-rounded? She was a bronze-medal finalist for a National Book Award for Poetry in 2001, won the Lenore Marshall Poetry Prize in 1999 — the first African-American woman to do so — and has Guggenheim Foundation and NEA fellowships in her resume. She's been a medical secretary, a magazine editor, a journalist, and a scriptwriter. She's worked in dance and collaborated with musicians. And she's the subject of this marvelous drawing by Norn Cutson. This "High Priestess of Word", who has profiles at Poets.org and the Poetry Foundation, is Wanda Coleman. Read an interview with her here. I recently came across a charming animation, The Windmill Farmer, by the award-winning and "mostly self-taught" Joaquin Baldwin, a director and animator from Paraguay who now lives in Los Angeles. According to the information accompanying the short, Baldwin spent four months on the film, which he created at UCLA Animation Workshop. He added a lovely original score by Nick Fevola. Take a look. I think you'll agree his more than 100 international honors are well-deserved. Seeing The Windmill Farmer prompted me to look up Baldwin's work, and I found other shorts on Vimeo and Baldwin's Website, including Sebastian's Voodoo, a 3-D animation that took 10 months to make. I think it is both compelling and moving to watch. Sebastian's Voodoo from Joaquin Baldwin on Vimeo. in a valley in Virginia. This poem was inspired by L.L. Barket's "It's a Pronoun Christmas" at Seedlings in Stone. One of the most deeply moving Christmas Eve masses I've experienced was at Holy Cross Abbey, in Berryville, Virginia, home to the Cistercian Order of the Strict Observance (Trappists). The secret to writing is writing. 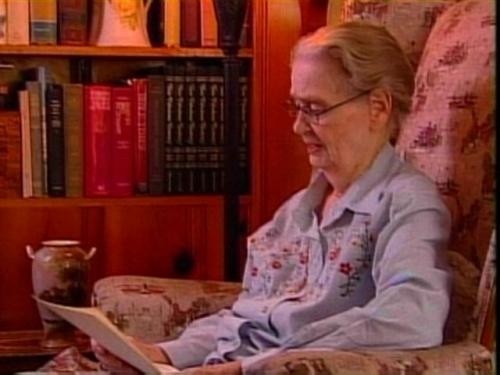 Marjory Heath Wentworth is the sixth Poet Laureate of South Carolina. She began her term in 2003, succeeding Bennie Lee Sinclair, who served from 1986 to 2000. Her and Sinclair's predecessors are Grace Beacham Freeman (1985-1986), Ennis Rees (1984-1985), Helen von Konitz Hyer (1974-1983), and Archibald Rutledge (1934-1973). The state legislature established the unpaid position in 1934 (General Assembly Joint Resolution 736; Code of Laws, Sec. 1-3-230), investing with the governor the privilege to appoint. The only requirement is that the person selected be "some outstanding and distinguished man [sic] of letters". Typically, the incumbent writes "occasion poems" for official functions, such as a governor's inauguration, and travels the state promoting and celebrating poetry. Wentworth has written a number of occasion poems, not only to celebrate a gubernatorial swearing-in but also to dedicate in 2005 Cooper River Bridge in Charleston; her latter poem honors a worker from Mexico who died during the bridge-building and is the title poem in Wentworth's Despite Gravity. The term of office is not fixed, and thus may be held for the life of the poet. Wentworth, who wrote a poetry column for The Charleston Post and Courier, gives poetry readings throughout South Carolina and around the United States (she has performed with the Paul Winter Consort at Yale University, given lectures and readings at many higher educational institutions, and participated in Block Island Poetry Project workshops), participates in book festivals, and serves on the boards of the nonprofit Lowcountry Initiative for the Literary Arts (LILA), which she co-founded with poet Carol Ann Davis, The Poetry Society of South Carolina, and University of South Carolina Poetry Initiative. The latter, which partners with the Office of the Poet Laureate, is a center for the promotion, celebration, and production of poetry at the university. 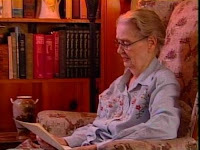 A resident of Charleston, Marjory Heath Wentworth has published a number of poetry collections: The Endless Repetition of an Ordinary Miracle (Press 53, 2010), Despite Gravity (Ninety-Six Press, 2007), and Noticing Eden (Hub City Writing Project, 2003). Her earlier work includes Cavedweller (1998), now for Sure (1995), Nightjars (Laurel Publishing, 1995), and Trash (1988). 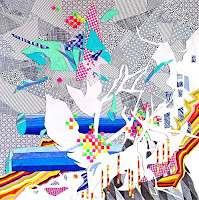 In addition, she collaborated with batik artist Mary Edna Fraser on What the Water Gives Me (BookSurge Publishing, 2002). She also has written an award-winning book for children, Shackles (Legacy Publications, 2009), based on a true story about the slaves of Sullivan's Island, a short distance from downtown Charleston. A new collection, The Sound of Your Own Voice Singing, is forthcoming. With Juan Mendez, she is writing Taking a Stand: A Human Rights Journey, which will be published by Palgrave MacMillan. Living in South Carolina's Lowcountry, Wentworth takes her inspiration from her natural surroundings; she's acutely attuned to sights and sounds that she describes in specific detail and with vivid imagery. She also draws deeply on her experiences with the United Nations High Commissioner for Refugees, The Whole World Institute, Church World Service, and Amnesty International, making geography and the human experience two particularly salient features of her poetry. As she said in an interview here: "I worked with refugees from Eastern Europe, Haiti, Africa, and Latin America, as well as those from Indochina. Their stories continue to both haunt and inspire me. Sometimes a poet's job is to bear witness and give a voice to the voiceless. There's something inherently redemptive about that process that is very rewarding." Among Wentworth's other themes: childhood, illness, home and family, love, death and grief, life on the barrier islands, politics, history, the beautiful in the ordinary, or what Wentworth calls "the small miracles that happen all around us each day". Below are brief excerpts from several poems that show well Wentworth's lyricism, range and depth, and striking use of detail. and steamships passed in the halls. . . .
so thick the stars are mute. . . .
a boat of bruised days made from twisted hands. you will not speak of, anywhere. Wentworth, who studied with Joseph Brodsky, Galway Kinnell, Carolyn Forche, and Philip Levine, among other highly renowned poets, has published her work in such publications as The Cortland Review, Lady Jane's Miscellany, Point, Skirt, and Brightleaf magazines, and Kakalak: An Anthology of Carolina Poets. She has been nominated a number of times for a Pushcart Prize. A book publicist also, Wentworth runs with her husband Peter Wentworth PR, which arranges local, regional, and national author and media tours and special events such as film premieres. your marks the x and arrow on the wall do plead. you might bleach from your saffron robe. the wind from his sails you took, his ship becalmed. eyes heavenward, maiden no longer on the prow? I wrote this poem for One Shoot Sunday at One Stop Poetry, which today features an interview with and selected work of Argentinean photographer Claudio Mufarrege, editor of the Imag-e-ination Daily, plus a Picture Prompt Challenge based on the image above. Anyone may participate in the challenge. Go here to read the interesting interview with Mufarrege and to learn what to do to accept the challenge. Be sure to leave there the link to your contribution. greenness, seeds, buds, or another kind of beauty. Catholic Encyclopedia Profile of the "Sibyl of the Rhine"
This week's edition ranges far and wide, from extraordinary examples of facial hair, to cartoonographs, to time capsules, holiday greeting cards, and the "Holy Jewel Home" of the "Original Rhinestone Cowboy". ✭ With a six-year Terra Foundation for American Art digitization grant, the Smithsonian Archives of American Art undertook in July 2005 an extraordinary initiative to make available on the Web a cross-section of its most important collections, including papers of artists and arts-related figures (dealers, critics, curators) from the 18th Century to today. Holdings include photographs, diaries, sketches, writings, and rarely published materials. By the end of the project, an estimated 1.2 million digital files will be accessible publicly. The project's background and a hyperlinked, alphabetized list of of more than 100 proposed or now fully digitized collections is here. All primary source material eventually will be available at Collections Online. Image searches may be conducted here. ✭ Extraordinary examples of facial hair are the subject of this blog by oral history interviewer Jennifer Snyder. Let it be known, however, that this is not the only virtual space intent on exploring the mustache or beard in all its forms. If your taste is limited to the 19th Century, you need only go here. Or perhaps you prefer The Handlebar Club. This recent post took up the matter of Abraham Lincoln's beard (go here for a slideshow on that) and bearded literary types. There's an American Mustache Institute, too; and, please, let's not forget what's coming up in February: International Mustache Month. ✭ Over at The Paper Internet, staff have something else on their minds: paper, which they are seeking to preserve for some future unknown civilization(s) via a network of time capsules containing photos, music, technical journals, and the stuff of everyday life. Once assembled, the time capsules are buried by volunteers at specific locations. Every time capsule or "node", which consists of 2,000 - 4,000 pages, contains the locations of all other time capsules. The project is described in detail here. ✭ As this wonderful post at The Bigger Picture makes clear, cartoonographs — facts in pictures — long preceded our 21st Century attempts at communicating in graphics. ✭ The Kohler Foundation's John Michael Kohler Arts Center, in Wisconsin, is tasked with preserving, studying, and exhibiting work of vernacular artists. Its collections of "artist-environment builders", comprising close to 10,000 artworks by two dozen folk and "self taught" artists, include the home of "Original Rhinestone Cowboy" Loy Bowlin (1909-1995) of McComb, Mississippi, who decorated walls and ceilings with glitter, cut paper, magazine images, ornaments, and spangles. The "Holy Jewel Home" has to be seen to be believed. Some images of the interiors, as well as Bowlin and his clothing and accessories, are here, here, and here. ✭ If you've ever wondered what old holiday greeting cards looked like, go here. The Smithsonian's Archives of American Art has mounted a show of the cards at its Victor Building in Washington, D.C. 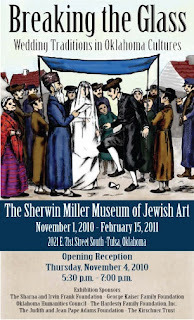 The exhibit is on view until January 3, 2011. Images from last year's exhibition are here. If you're coming to town and want to see the cards in person, go here for directions, a map, and hours. United States Artists, which I last mentioned here, devotes a section of its Website to "Projects" that anyone may fund directly. Its current projects list encompasses visual arts, music, crafts and traditional arts, dance, theatre arts, literature, architecture and design, and media such as film. Each listing is fully described on its own page, along with the number of days remaining for public funding, amount of money to be raised and amount remaining to be raised, and number of supporters. Levels of pledges for different projects range from $25 to $1,000 or more, which means that anyone with some extra change and a desire to help an artist accomplish a project can do so. Artists who post projects on USA's site offer a variety of "perks" to their supporters, from public recognition on social media sites, to a signed print of a design, to exclusive access to a project blog, to an original photograph, hand-made thank you card, or CD. The kinds of projects seeking funding vary widely, from creation of a temporary outdoor installation on MIT's campus that will transform wind into light, to development of an educational resource documenting a young poet's exchange with his mentor, poet Donald Hall, to an Arctic expedition. There are a number of success stories. For example, artist Judith Schaechter's project to make stained glass windows for historic Eastern State Penitentiary in Pennsylvania had a $5,000 goal. Supporters pledged more than $10,000, or 205 percent. Industrial designer and Readymade Projects founder Stephen Burks sought $7,500 to produce a documentary series, "Made on Earth"; he received pledges of more than $15,000, or 201 percent of his target. In some cases, supporters' pledges are eligible for corporate or foundational matching funds. Any artist who has received an award or grant from a USA partner or recognized organization is eligible to post a project. Go here for details. Even if you can't afford to give to a specific project, visit the site and take a look around just to inform yourself about the breadth and depth of artistic initiatives. ✭ The Provincetown Art Association and Museum, Provincetown, Massachusetts, is showing Rachel Brown Photographs: Nature in Action" through January 30, 2011. 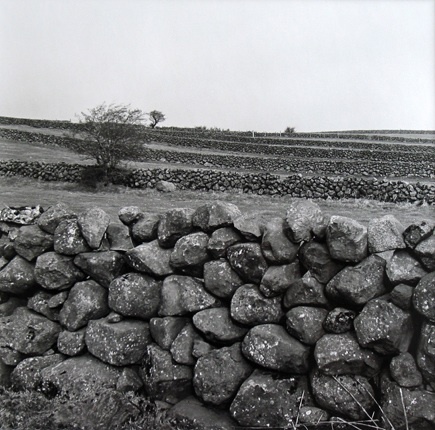 Work in the exhibit is drawn primarily from three of Brown's projects: "Clouds", "Snow", and "Fieldwork", which Brown describes as "a documentary study of the things people make as part of their work, creating a new landscape, interacting with nature, rebuilding the architecture of place." Brown, who has photographed and exhibited around the United States and abroad, including in France, Northern Ireland, the Netherlands, and Germany, has shot authors' portraits and book covers; most recently, she did the cover for Out of the Earth: Ecocritical Readings of Irish Texts, edited by Christine Cusick (Cork University Press, 2010), and for Hult Hely, a translation into Hungarian of a collection of poetry of Seamus Heaney (Kalligram, 2010). Her own books include Rachel Giese: The Donegal Pictures. (Faber & Faber and Wake Forest University Press, 1987). ✭ In Louisville, Kentucky, Speed Art Museum has mounted "Modern in the Making: Design 1900-2000", on view until April 3. The exhibition, drawn from the museum's own 20th Century design collection, features furniture, ceramics, silver, and other objects ranging from French Art Deco to Bauhaus to mid-century Modern to Post-Modern. ✭ Connecticut's Center for Contemporary Printmaking, in Norwalk, is showing through January 30 "Leona Pierce & Antonio Frasconi: Woodcuts". (Pierce is Frasconi's late wife.) Frasconi (1919—), of Argentine birth, is known for "The Disappeared", a haunting series of woodcuts depicting persons who were "disappeared" during the period of dictatorships in Uruguay that ended in 1985; Pierce (1921-2002) is known for colorful woodblock prints of children at play in New York City streets. Both artists are in the collections of the Museum of Modern Art and the Brooklyn Museum of Art, among other museum collections. 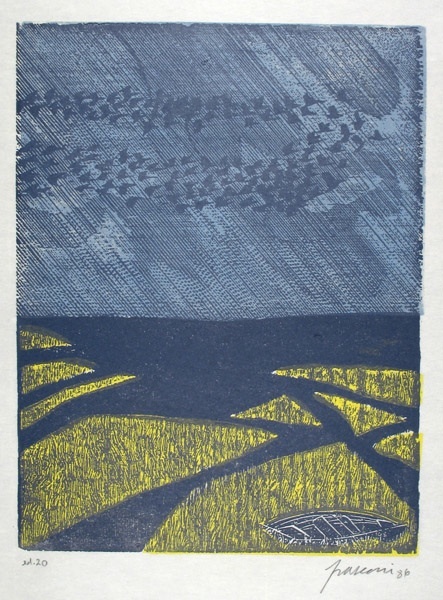 For this show, Frasconi is exhibiting work inspired by the wetlands and marshes of Long Island Sound. ✭ The Smithsonian's Cooper-Hewitt, National Design Museum, New York City, is presenting through January 9, 2011, the "National Design Triennial: Why Design Now? ", which looks at the work of designers addressing human and environmental problems across the many fields of design practice. At the exhibition's Website, you'll find information on some of the project themes, including energy, mobility, health, communication, and simplicity. The 16th Annual Los Angeles Art Show 2011 is scheduled for January 19-23 at the Los Angeles Convention Center. Presented by the Fine Art Dealers Association, the event is open to approved galleries from around the world, and will feature artwork from all genres, painting to video, and from all periods, from Old Masters to Contemporary. In addition to the gallery exhibitors, there will be a Guest Country Program and a series of lectures with curators, artists, collectors, art writers, architects, art history scholars, and film producers and directors.